The Secret Life of Check Valves | Tennessee Aircraft Services, Inc.
A failure of the undercarriage retraction system doesn’t create an emergency, but it does create a lot of stress in the cockpit. That stress may occur before the belly landing or after, depending on the cause. Should the pilot forget to extend the gear, everyone is happy right up to the moment when disbelief occurs; then the stress happens. If the undercarriage experiences some mechanical failure in flight, most of the stress and disbelief occurs while the pilot must also manage flying the airplane. Just as better training and procedures can help mitigate pilot forgetfulness, the same may be said to stave off many mechanical failures of the landing gear system. 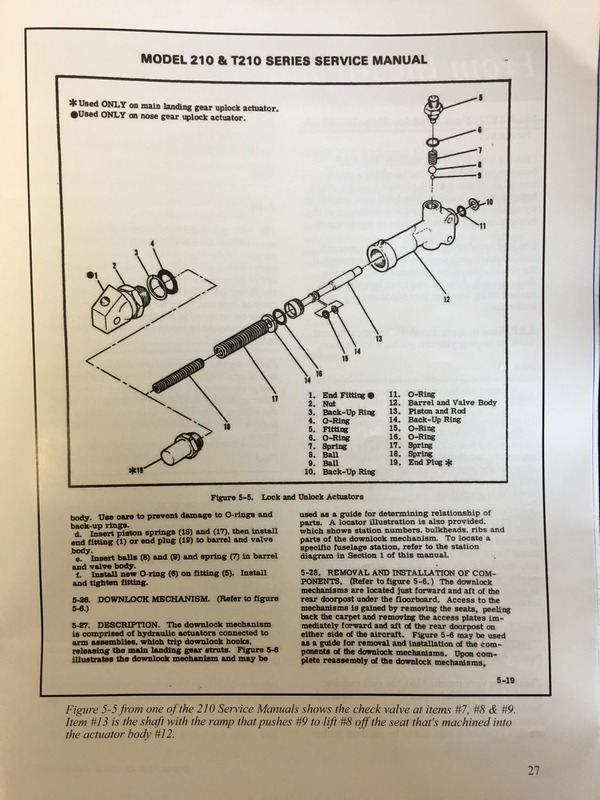 I recently completed a five part series on the rigging of the Cessna 210 undercarriage retraction system. As a result, there has been a significant uptick in phone calls to my shop from mechanics and Cessna owners requesting troubleshooting help. Most are the typical gear system issues, but a few have been very complicated. It turns out some parts were left out of the actuator or installed incorrectly during relatively routine servicing. This created an uncommon system operation with resulting undue flight crew stress. As mechanics, we pride ourselves on being able to understand the internal workings of the systems we maintain. The ability to disassemble and reassemble a complex component by memory without leftover parts is considered a basic skill. There was always that one guy/gal in shop class, A&P school or avionics school who would quietly walk by someone’s work station and drop an extra screw in the hardware pile. The frustration of having that one left over part and no way to figure out what to do with it was enough to make one’s head explode. When we know a system well, the little details are seldom missed. When we don’t know the minute details, we’re setting ourselves up for failure. A common thread in these recent calls is related to actuator check valves, which are hidden from view and understanding. The uplock and downlock actuators are small and have few parts, so there is a temptation to skip service manual and parts catalog references. Each one has two small BB sized balls with a spring that make up a check valve. Due to their small size and location, these parts have a propensity for escaping to the shop floor gods. Close adherence and reference to the service manuals and illustrated parts catalog goes a long way toward mitigating many hours of unnecessary trouble. There are certain events in undercarriage retraction and extension that must happen in a proper sequence. A couple of obvious examples would be opening the gear doors prior to extending the gear or releasing the locks before trying to move the gear. Of interest today is releasing the locks before applying power to the gear actuators. When the gear handle is selected to a position opposite that of the gear, hydraulic pressure is sequenced first to the door actuators. Planes that have been modified by removal of the main gear doors will still have the critical part of the system that shuttles hydraulics between the doors and the gear actuators. The 1979 and newer planes came from the factory with no hydraulically actuated gear doors, so hydraulic pressure goes directly to the gear actuators. Once the system has decided the doors are open, hydraulic power is diverted to release the uplocks or downlocks, whichever is relevant. Each uplock and downlock has a check valve that inhibits flow until the lock is fully opened. Should hydraulic pressure get to the gear actuators before the locks are released, the added stress would likely bind the locks in place or cause some undesired damage. The check valves are made up of two different size steel balls and a spring. The larger of the two balls is pressed against a seat by the spring, which creates the closed position of the check valve. The small steel ball rides on the lock actuator shaft. The shaft includes a ramp that pushes the ball away from the shaft centerline as the shaft retracts. As the smaller ball is pushed away from the shaft, it forces the larger ball off the seat. The valve is now open and allows hydraulic flow to pass. For gear retraction, hydraulic pressure goes from the power pack to the right gear downlock and retracts it. As described, this opens the right downlock check valve and allows hydraulic pressure to pass to the left downlock. The left downlock retracts, and its check valve opens, also allowing hydraulic pressure to pass. This time the pressure moves to the main gear leg actuators. After both main gear downlocks retract, the main gear legs will fall into the trailing position. One might think this would happen in such a way that the right leg would drop, then the left. The action of the two downlocks is so fast that it almost happens simultaneously. The initial dropping of the gear legs into the trailing position creates low pressure in the system. It takes the hydraulic pump a couple of seconds to catch up; then the legs begin the upswing into the wheel wells. The transition from uplocked gear to gear moving downward is very similar except there is one uplock for the mains and one for the nose. These two uplocks receive pressure at the same time, and both have the same type check valves as the main gear downlocks. No hydraulic pressure can get to the nose gear actuator on the down side until the uplock is fully retracted and has released the nose gear. Just the free fall and flight air pressure are usually enough to send the nose gear to the full down position. The one main gear uplock must also be fully retracted before any power is sent to the two main gear actuators in the down direction. Just as in the retraction mode, the mains will fall to a trailing position until the hydraulic pump catches up. Then the legs begin moving forward and up into the down saddles. It’s a thing of beauty to watch when everything is rigged and all the parts are in place. All the parts being in place is the operative phrase when working on these actuators with check valves. I give the designers an A+ for these check valves. The operation is simple and very reliable. If I had to say anything negative about them, it would be how easy it is to lose the two check balls during maintenance. If a mechanic isn’t paying close attention when opening the actuator, he or she can bet at least one of the balls will run and hide. The check valves are built into the two main gear downlocks, the nose gear uplock, the main gear uplock and the door lock out valve (only on the 210K). Assembly errors include missing balls, missing spring, wrong size balls, reverse installation or just not installing the valve parts at all. What these errors mean to system operation depends on which actuator has valve troubles. A missing small ball in the nose gear uplock actuator causes the valve to not open, and no fluid will pass to the nose actuator. The nose gear will easily free fall into the down position due to gravity and wind. The downlock will engage due to the downlock spring, but any friction in the system will slow the lock engagement. This is a very frustrating problem to track down because one doesn’t know what’s causing the delay in getting a green downlock light in flight. It could very well appear to work perfectly with the plane on jacks. The same small ball missing from the left main gear downlock allows full retraction of the downlocks and resulting release of the gear legs. With no small ball to push the large ball off the valve seat, no fluid passes to the main gear actuators. As a result, both main gear fall into the trailing position and just hang there. A small ball missing from the right main gear downlock allows the right downlock to retract, but no hydraulic pressure will pass the left main gear downlock. The right main gear will fall into trailing position and just hang there by itself. The left main will stay secure in the down and locked position. A large ball missing from any of these actuators will allow the secondary actuator to move before or at the same time as the lock actuator. This may present as a gear actuator intermittently getting hung in the lock. A spring missing from a lock actuator check valve could also cause intermittent main actuator operation. These are just a sample of the failures we’ve seen. All were caused by improper assembly during routine resealing of the lock actuators. It can be difficult for the mechanic performing the original repair work to identify the cause due the odd nature of the resulting symptoms. It should be apparent that the work performed caused the problem, but critiquing one’s own work is analogous to editing one’s own writing- very difficult. In an old school hydraulic systems, designers preferred to rely on actual movement of mechanical parts for system sequencing whenever possible. This system using check valves mechanically operated within the lock actuators is an excellent example of simplicity and efficiency. When all the parts are installed in the proper locations the system works extremely well and reliably. If you own a retractable gear single engine Cessna, maintenance will eventually be performed on the undercarriage retraction system. During this event, I would strongly recommend paying very close attention to system operation before and after the work. The best scenario is that the incoming squawk is eliminated and all works as it should. Any new or slightly off normal behavior should be studied closely and quickly. The first suspect would be the work just performed. This mindset also suggests that one understands exactly which components were worked on and why. If you see any reference to downlocks or uplocks, remember these secret little check valves. Failed undercarriage retraction and extension systems don’t cause bodily harm. Whether landing with one gear down, two gear down or no gear down, no one gets hurt, there won’t be a fire and this is not an emergency. As the car insurance commercial says, “no one is hurt, but there will be pain”. The pain, of course, is to the pocket book and the travel schedule. If you find yourself in a gear failure situation, the point is to stay calm, don’t create an emergency and be sure your insurance is paid up.